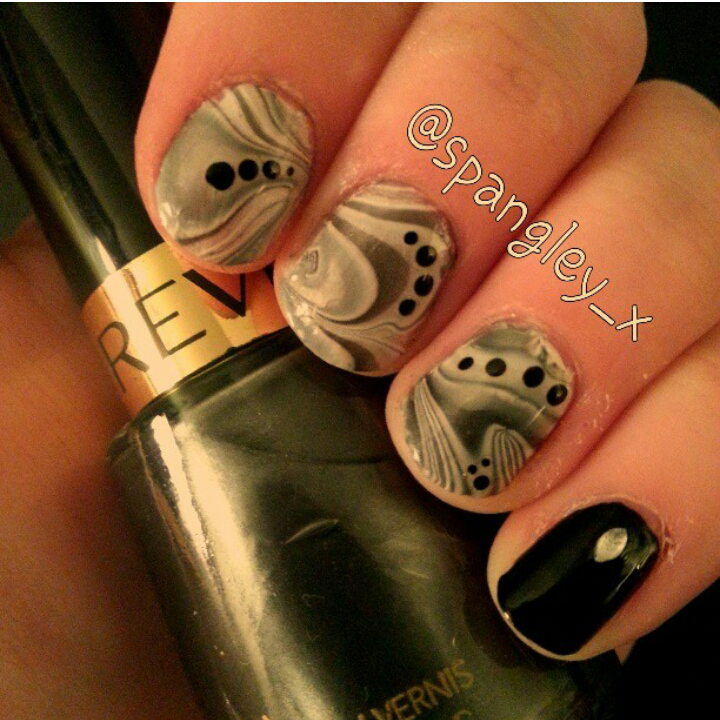 I thought it would be perfect to start my #TBT series off with Water-Marble. I first attempted water-marbling 82 weeks ago, and at the time, gave myself 6 out of 10 - CLEARLY I was being a little cocky. Looking back, my attempt doesn't even deserve 0.6 out of 10! Even although I can still see mistakes with these nails today, I am still much happier with them, and can defiantly say its one of my best water-marbles to date. I started off by painting all of my nails with Sinful Colors - Snow Me White. I never done this in my previous, 82 week old attempt. I also used scotch tape, to tape round my finger, this helps with clean up. Next, I started dripping Barry M - Black, Sally Hansen Xtreme Wear - Wet Cement and Showtime into a plastic cup that was filled with room temperature, bottled water. Using my smallest dotting tool, I started to drag a pattern into the polish. I picked the part of the pattern I liked best, and "dunked" my finger into it. Whilst my finger was still in the water, I used a cotton bud or Q-Tip to gather up all of the polish still floating in the water. I then brought my finger out super slowly & removed my scotch tape with scissors. Finally, I cleaned up around the edges and added a topcoat. For a little added bit of bling, I stuck 2 small silver studs to the top of my nail. Always tape round your finger! It minimises clean up and just generally makes your water-marbling career 10 times easier! Always start with a base colour of white polish. This helps the polish your working with in your marble become really opaque when it touches your nail. Use room temperature, bottled water. I always just keep a bottle of water at my nail station so whenever I feel like gettin' my marble on - I'm ready! I used to think you needed to "dunk" your dotting too or toothpick into the polish that you have dripped in the water. I have since found out that you only need to drag the surface of the polish on the top. Sometimes I use a needle for super precise lines. 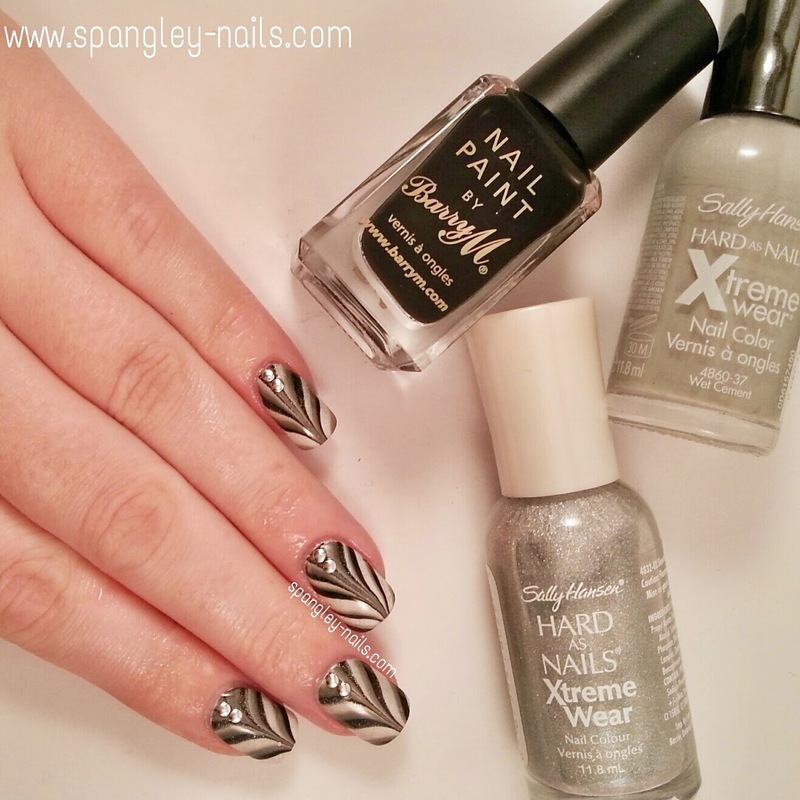 Experiment with polish, patterns and find out what works best for you! 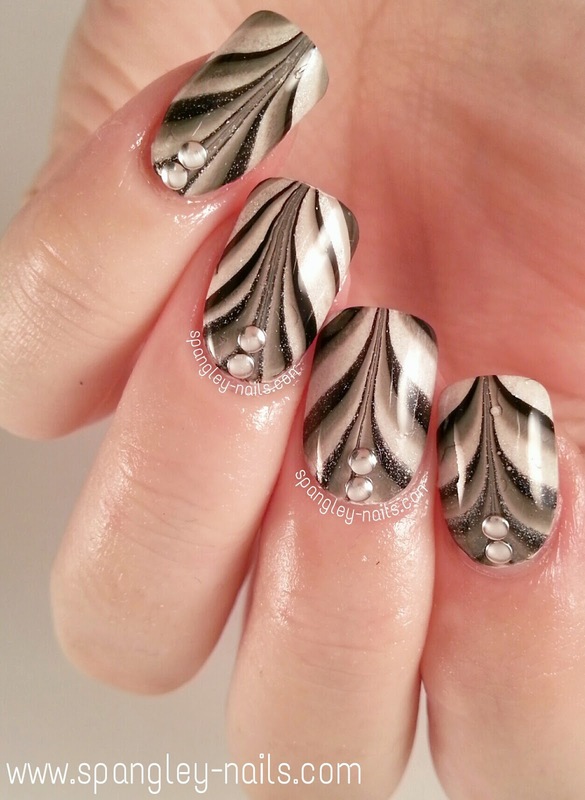 Its just the same with stamping - not every polish will stamp, this goes for water marbling. I'm working my way through my stash to see what I can use and what I can't. Do you have any more tips for us fellow water-marblers? I'd love to hear them, so be sure to leave a comment if you do! The music to today's tutorial is Don't Stop Believing by Journey, because you shouldn't give up on Water-Marbe and say that you can't do it, if you practice & follow my tips from above, you'll surprise yourself :-) it's taken me 82 weeks to get to where I am today & I'm still learning.